. Tolmie is now considering putting a hat on Mac – or even placing him on hockey skates. But for now, the ten-metre high Norwegian metal moose made by artist Linda Bakke is still the larger of the two. It stands steadily on its four feet in the Bjøråa rest area on Riksvei 3, about 110 kilometres north of the city of Elverum, for everyone to see. But for now, the 32-feet high Norwegian metal moose made by artist Linda Bakke is still the larger of the two. It stands steadily on its four feet in the Bjøråa rest area on Riksvei 3, about 70 miles north of the city of Elverum, for everyone to see. Watch the hilarious Moose Truce video, made by the locals in Stor-Elvdal and RedAnt. The Norwegian silver-moose was originally made to wake up sleepy drivers and draw attention to the many moose crossing the road in the area, as well as act as a reference point on the stretch between Oslo and Trondheim. Storelgen has also become an identity symbol for the municipality of Stor-Elvdal, an area with lots of wild moose. But Storelgen is not the only moose in Norway. Read on for seven other ways you can safely encounter the king of the forest in other parts of the country. 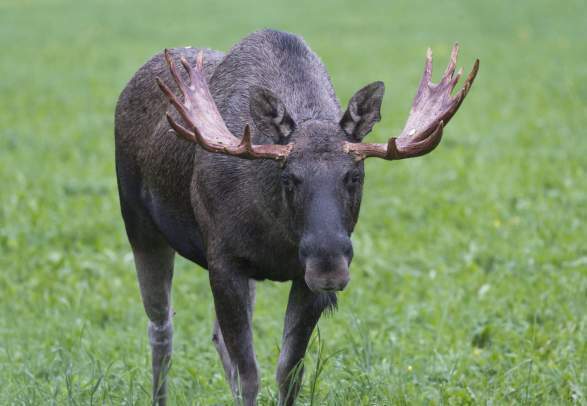 Every spring and autumn, a moose migration that counts up to 700 animals takes place in the lower areas west of Lake Mjøsa and the higher areas in Espedalen, Skåbu, and Murudalen west of the Gudbrandsdalen valley. In contrast to migrating moose in other parts of the world, the moose in Elgland wander to spend the winter at high elevation, before they stroll back down in the spring. They are highly faithful to their migration route, which they’ve been following for the last 10,000 years. in Elgland, where the aforementioned hundreds of moose migrate to and from the mountains every spring and autumn. Don’t worry if you miss the great wanderings, though – you’ll spot moose here all year round. The tower, drawn by Hilde Grøneng of RAM arkitektur, has accommodation for eight, and the large windows make sure that you don’t miss a single outside movement. in Norway, you can meet moose up close. The moose park Elgtun in Bygland is a whole park dedicated to friendly encounters with moose. 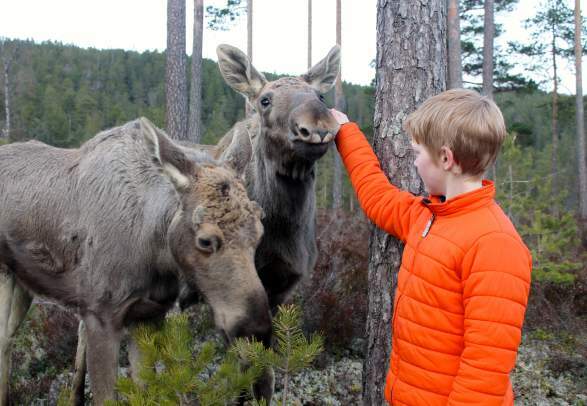 In Bjørneparken in Hallingdal, just a couple of hours from Oslo, you get to kiss the tame moose Eline and feed her carrots, whilst at EKT Langedrag, also in Hallingdal, you’ll meet the cow elk Ea’s adorable triplets. Other nature parks with moose are the Norwegian moose centre in Stor-Elvdal, Dyreparken Zoo and Amusement Park in Kristiansand, the wildlife park Namsskogan familiepark in Trøndelag, and Polar Park in Narvik. in Norway, you can meet moose up close. The moose park Elgtun in Bygland is a whole park dedicated to friendly encounters with moose. In Bjørneparken in Hallingdal, just a couple of hours from Oslo, you get to kiss the tame moose Eline and feed her carrots, whilst at EKT Langedrag, also in Hallingdal, you’ll meet the cow elk Ea’s adorable triplets. Other animal parks with moose are the Norwegian moose center in Stor-Elvdal, Dyreparken Zoo and Amusement Park in Kristiansand, the wildlife park Namsskogan familiepark in Trøndelag, and Polar Park in Narvik. On a guided E-bike tour in the Dovrefjell mountain range, you’ll get to see moose in the twilight – as well as deer, badgers, and foxes if you’re lucky. Also, the view is so beautiful that you’ll probably be satisfied even before you’ve spotted your target. Remember to bring warm clothes – and your camera! At a road crossing in Elverum, you’ll stumble across Norway’s most famous moose restaurant. Elgstua has been serving delicious homemade food since 1959. Besides variations of moose, you’ll find plenty of other lovely food on the menu. You can also have a taste of moose in several other Norwegian restaurants, especially in areas where they are plentiful. like T-shirts, hooded tops, caps, socks, underwear, key rings, and lots of other fun stuff. So many places offer moose safaris that it is impossible to write about them all. So we’ve made a handy map where you can find a moose safari near you. The moose is a yoke-toed species in the deer family and the world’s largest deer game. It is Norway’s largest land mammal and differs from other deer species in size and appearance. The largest males can weigh up to 800 kilos. Moose are really made for winter. Even on days with temperatures down to -30 degrees Celsius, they only react with a light attack of gooseflesh. In warmer weather, though, it only needs to get slightly above the freezing point for a moose to start panting. The moose is also a great swimmer, as they experienced on the remote island Træna in 2005. 40 kilometres from the mainland, a moose suddenly climbed onto dry land a day in July. The sight is so unusual on the island that they raised a statue of the moose Tare. The moose is a yoke-toed species in the deer family and the world’s largest deer game. It is Norway’s largest land mammal and differs from other deer species in size and appearance. The largest males can weigh up to 1,750 pounds. Moose are really made for winter. Even on days with temperatures down to -22 degrees Fahrenheit, they only react with a light attack of gooseflesh. The moose is also a great swimmer, as they experienced on the remote island Træna in 2005. 25 miles from the mainland, a moose suddenly climbed onto dry land a day in July. The sight is so unusual on the island that they raised a statue of the moose Tare.